Divers recently found the wreck of the L. R. Doty that disappeared in a gale on Lake Michigan on October 24, 1898 with all 17 members of its crew. The 291-foot-long ship was found upright, intact and well preserved in about 300 feet of water according to divers for the Wisconsin Underwater Archaeology Association who made the discovery. The Doty, built in 1893, was among the largest wooden hulled bulk carriers operating on the lakes when it was lost only five years later. It was common practice among shipbuilders to reinforce those extra longer wooden hulls with steel arches to give them additional strength when battling gales. 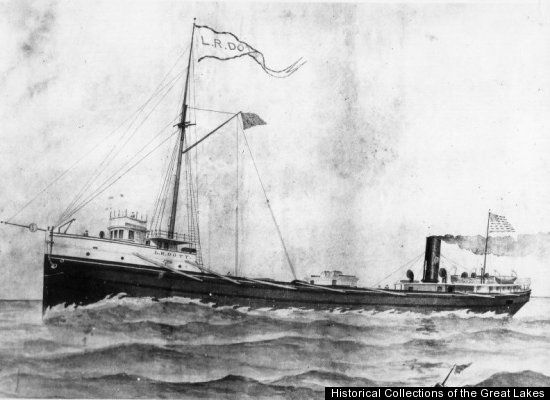 This steamer was laden with 107,000 bushels of corn and towing the schooner-barge Olive Jeanette, heading north from Chicago, when the two vessels encountered the storm off the Wisconsin coast. Either the tow line snapped or the skipper of the Doty decided to cut the schooner loose in the midst of the gale. The crew of the Olive Jeanette hoisted sail and returned safely to Chicago. The Doty was never seen again. The divers found that the Doty’s rudder chain broke which caused the ship to fall into the trough of the waves. It was speculated that the schooner’s tow line snapped and the steamer got into trouble while trying to turn around in the storm and go to the aid of the drifting barge. Once the wind and waves were slamming against the drifting Doty from broadside, the force of the onslaught soon tore away the ship’s wooden hatch covers and the vessel quickly foundered. The Doty struck stern first then settled upright on the clay bottom. Divers said the rudder was turned hard to port. The search for the Doty was misdirected because debris from the wreck washed up at Kenosha, about 40 miles south of where the steamer actually sank. But one news clipping quoted an observer who claimed to have last seen the ship near Milwaukee. The in 1991, a Milwaukee fisherman snagged his nets on something about 300 feet under the water and marked the location. A sonar scan confirmed that a large sized shipwreck was at that site. Special deep-sea diving equipment was used to reach that depth and confirm that the wreck was, indeed, the Doty.